The Allt a’Mharcaidh catchment lies in the heart of the Invereshie and Inshriach National Nature Reserve (NNR), on the north-western edge of the Cairngorm mountains, close to the village of Kincraig. It is one of a suite of nine NNRs within the Cairngorms National Park. Extending to over 3,600 hectares (ha), the Reserve includes both ancient Caledonian pinewood and younger Scots pine woodland. A key feature of the Allt a’Mharcaidh catchment is the regeneration of Scots pine woodland, which is now colonising the lower slopes above these ancient stands. Beyond the woodland the slopes are largely covered by wet and dry heath, with further areas of blanket bog. Higher still the land is characterised by the Arctic-alpine environment of the high mountain plateau and the summits of Sgor Gaoith and Carn Ban Mor to the east. The woodlands of the Reserve are part of a continuous chain of Caledonian pinewood that stretches from Glen Feshie in the south-west, through to Rothiemurchus estate and Glenmore NNR, to Abernethy Forest NNR in the north-east, forming the largest area of Caledonian pinewood in Scotland. The varying altitude means an incredible diversity of habitats across the reserve and an impressive mix of iconic Scottish wildlife. 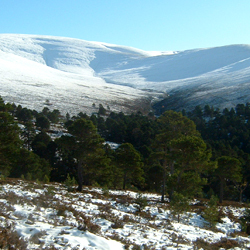 The pinewood provides refuge for rare species such as pine marten, red squirrel, twinflower and the Scottish crossbill. The moorland is home to red grouse and golden eagle. On the mountain plateau, a soft mantle of moss heath provides habitat for breeding ptarmigan and dotterel. Red deer roam these hillsides and rare lichens, liverworts, mosses and fungi flourish in the sheltered woodlands and up to the highest peaks. The Reserve is managed by Scottish Natural Heritage (SNH) and Forestry Commission Scotland (FCS). One of the purposes of the NNR is to offer opportunities for research into the natural heritage and so SNH and FCS welcome the contributions the various research bodies are making within the Allt a’Mharcaidh catchment. The site managers also make sure that research does not impact on the special qualities of the NNR. A permit system operates for all research. A key component of the research in the catchment is the long-standing Environmental Change Network (ECN) monitoring project, which CEH runs with funding from SNH. The aim of ECN research is to monitor the effects of environmental change on biodiversity within the catchment, which is achieved through the recording of a large suite of environmental, biological and chemical data. Monitoring results are also important for providing a background resource for future research projects undertaken within the NNR. Both CEH and SNH carry out related wildlife monitoring projects and are able to share the results to get more detailed information about the NNR's wildlife. We also share statistics in relation to visitors which improves our understanding of the recreational use of the NNR. This is important for both management practices and as a component of ecosystem services research in the catchment. Invereshie and Inshriach is one of 58 National Nature Reserves in Scotland. These NNRs are special places for nature, where some of the best examples of Scotland's wildlife are managed. Every Reserve is carefully managed both for nature and for people, giving visitors the opportunity to experience the rich natural heritage.